Elton John‘s world was spinning fast in November 1973, but at least two key events will be etched in his memory. One was that he became Vice President of his beloved Watford Football Club, and the other was that he scored his third US No. 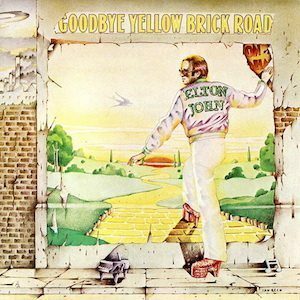 1 album with Goodbye Yellow Brick Road. The indefatigable singer-songwriter thus ascended to the American album summit for the second time in a mere eight months, and the third in 16. 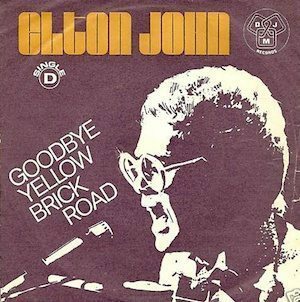 Honky Chateau had served notice of Elton’s arrival at rock’s top table by leading the Billboard listings in July 1972, after which Don’t Shoot Me I’m Only The Piano Player repeated the trick, the following March. John had started the month of his Yellow Brick Road triumph by performing the title track hit at his televisual second home, Top Of The Pops, and was soon to start a British tour. But the US success was nevertheless still a very big deal for an artist who, like his lyricist partner Bernie Taupin, had invested so much of his musical personality in American musical and cultural history. The Rolling Stones had spent four weeks at No. 1 with Goats Head Soup when Elton replaced them at No. 1 with this landmark double LP on the chart of 10 November, 1973. Goodbye Yellow Brick Road then dominated proceedings for the rest of the year, with a notable eight-week reign through Christmas that only ended when the Carpenters‘ The Singles 1969-1973 took over in January 1974. As Elton ruled America again, his interview with Stephen Demorest appeared in Circus magazine, in which he described his working relationship with Taupin with both realism and humour. “Lyrics are always first,” he said. “If I don’t have the lyrics I don’t write any songs. If Taupin is barren, that’s that. I don’t write on the road. But it never ceases to amaze me how quickly I can write.